Most restaurants worth their salt have soft openings. These are dry runs – nights when eateries have time to work out any kinks in their dishes, as well as receive feedback on presentation, ambience and service before they officially launch during a grand opening. New Italian restaurant at The Pottinger Hong Kong hotel, Gradini, has just had its soft opening. And we write this review just 30 minutes into it because that’s all the time it takes to blow us away. We’d been hearing about this place for a while before the soft opening. Helmed by Italian Giovanni Greggio, who came out of retirement for this project after more than a decade working at Nicholini’s at the Conrad Hong Kong, there had been a buzz about it. And as a result the restaurant had been accepting tentative reservations, not knowing when it would receive its operational licence. But when we hear of the restaurant's official launch at 7pm on a Friday evening, we scramble to change our dinner plans, and it turns out it’s worth it. Gradini’s cosy interior is offset by a 20ft-high ceiling that overlooks the hustle and bustle of Queen’s Road Central. As we enter the space, we want to kick into an aperitivo at the entrance to the bar area – itself furnished with grey marble tables and plush chairs – but we’re told there’s no alcohol served at this time due to the liquor licence not being ready. So we move straight into the main dining room, a contemporary, elegant space with a soft colour scheme of sage and grey tones, alongside dapper waiters in white tuxedo jackets. Taking one of the booths by the window, the waiter serves us non-alcoholic drinks (lime soda and fruit punch) and a bread-basket filled with ciabatta rolls, cheese grissini and a hearty country-style bread with figs. We’re also offered olive oil and balsamic vinegar – and particularly enjoy the 25-year-old vintage, with its velvety texture and sweet taste. The menu at Gradini is not experimental but instead focuses on refining the classics, with ample choices of pastas, meat, appetisers and soups. The flavours, while authentic, veer on the lighter side. For starters we plump for the Caesar salad, which is prepared tableside ($95) and in addition to selecting from a platter of anchovies, dressing, chopped garlic, bacon and croutons to throw into the mix, the finesse move is a ‘tasting portion’, ensuring the balance is to our personal taste before the salad is served. Moving on to the first course, our risotto with langoustine ($290) is beautifully presented, with the crustacean peeping out of the flavoured rice, its flaky flesh from the tail easily removed. The dish uses carnaroli rice from the Vercelli region of Italy, a grain known for its firm texture, which retains flavours better from the long cooking method of risotto. The chef, having worked in Hong Kong before, clearly understands how to appease the local palate without sacrificing authenticity. We also try the lobster tagliolini ($360), which sports a flavourful tomato and basil sauce and a plump, juicy, lobster claw. 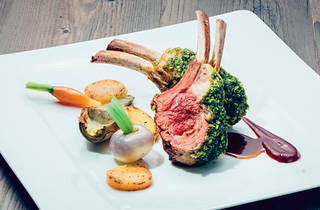 But what really takes our breath away are the lamb chops (pictured above, top/ $380). Each of these beauties resembles a 4oz filet mignon in size and they’re juicy, rich, tender and drizzled in lamb jus with a dollop of Chianti-flavoured mustard and mint jelly on the platter. 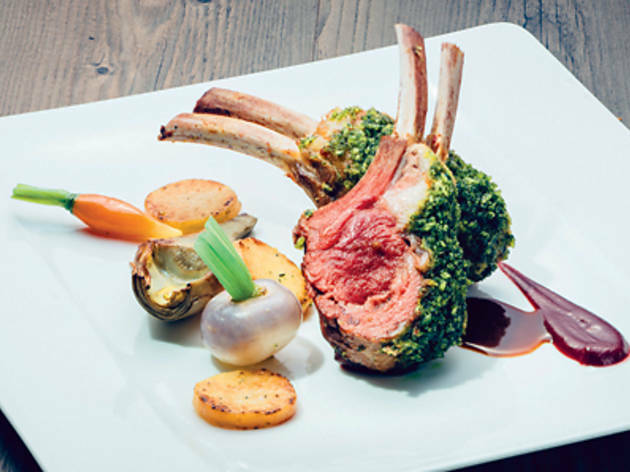 The chops personify the restaurant – there is nothing inventive here, but there’s meticulous attention to detail and high quality ingredients and cooking techniques on display. Desserts are plentiful at Gradini and we sample the panna cotta ($75), which is both creamy and sweet, as well as the smooth tiramisu ($75), which comes served in a tea cup yet gets all those coffee flavours just right. However what really makes the meal memorable is what comes last: chocolate cake with Hong Kong-style milk tea ice cream ($75). The ice cream’s fragrant tea flavours work wonders alongside the dense chocolate cake, which itself is rich in texture, not too sweet and a delight after a wholly successful meal. Gradini The Pottinger Hong Kong, 74 Queen’s Rd C, Central, 2308 3188; thepottinger.com.